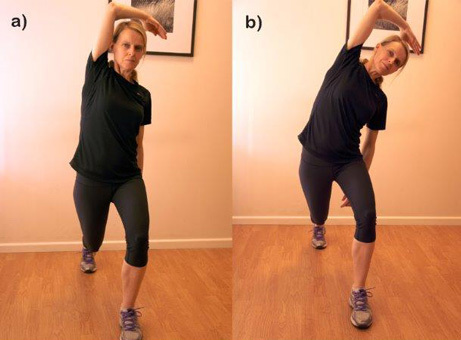 a) As you lunge forward take the opposite arm over your head flexing the elbow to 90 degrees. Don’t lean forwards. Keep walking forwards alternating legs and arms. b) As above but as you take the arm over your head also flex your trunk to the same side as the forward leg. Do 2x10. Into downward dog position. On the floor, leaning through straight-arm and legs, bottom in the air. The further apart your hands and feet, the harder it is. a) Slowly pump your feet up and own trying to get your heels flat on the floor 2x10. b) Wrap one foot over the other ankle and force the foot down, hold for 2secs x10 each leg. 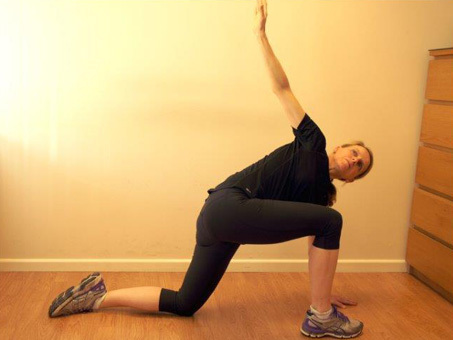 Get into a lunge position and place the opposite hand on the floor so you are supported through that arm. Rotate your trunk towards the front leg and straighten the non weight-bearing arm. Then rotate your trunk back towards the supporting arm, flexing your free arm taking between the front leg and supporting arm so you feel strong rotation in your trunk. Repat x5. In standing, flex up one hip and knee as far as you can, the take this leg back into the leg position of a lunge. The weight bearing leg flexes at the hip and knee and you touch the ground in front with both arm. Try and feel the stretch in the back leg hip. Repeat x5 and then change over. Repeat x2 with each leg.